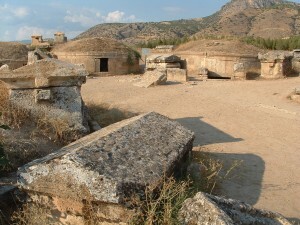 Hirapolis located in the province of Denizli. 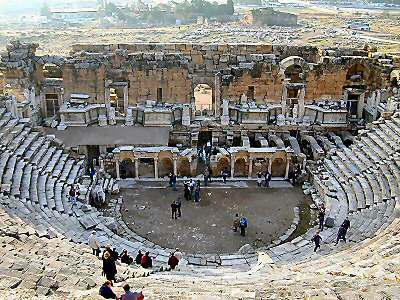 This place is more often referred to using the prefix Pamukkale, Pamukkale Hirapolis. 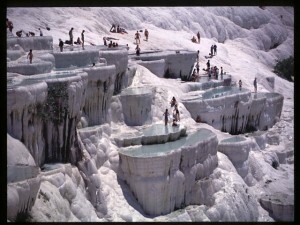 Pamukale derived from the Turkish language, which means ‘cotton castle’. 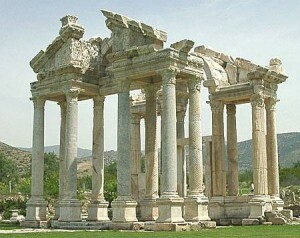 It is very famous for its historical heritage and natural beauty. In Pamukale there are two major tourist sites which Hierapolis and Travertine’s. 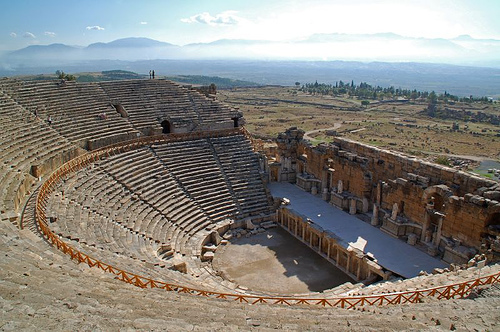 Hierapolis is an old town that stood during the Roman Empire and the Byzantine empire. Named Hierapolis because there was once here Hiera temple (one of the Greek gods). There you will be able to see the view from the ruins of buildings, cathedrals, temples, walls, pillars, amphitheaters, and old tombs (the necropolis). 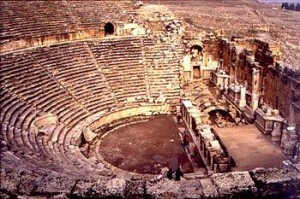 It will take more than 2 hours to explore this historic place. 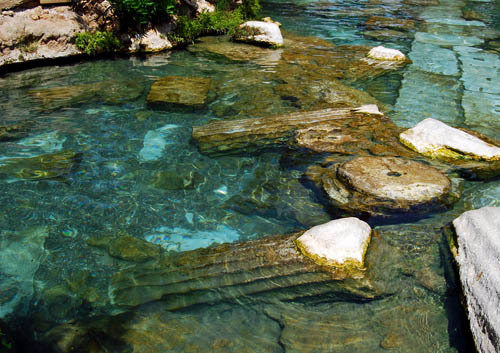 While Traver tines is limestone or limestone mountain formed from calcium carbonate deposits. 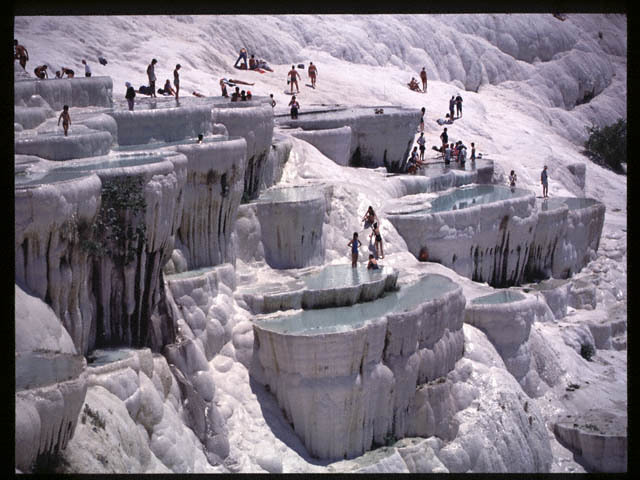 The white rocks are naturally formed thousands of years ago. From a distance it looks like an Travertine’s rise with hot water in it. 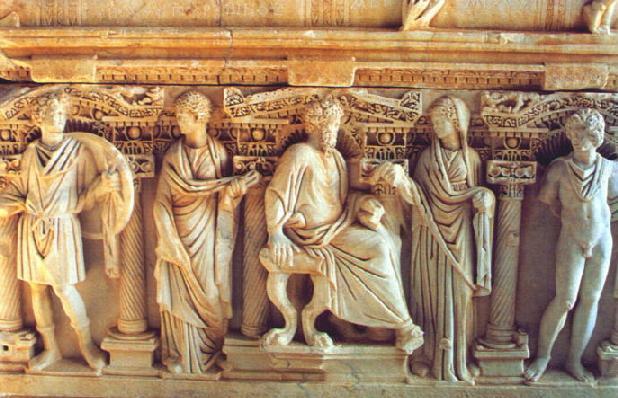 Traver tine beauty makes this place is always packed with visitors. You can enjoy and soak in the hot tubs there. Pamukkale there are two gates to enter, the gate near the bottom of the Traver tine’s and the gate near the top of Hierapolis. Pamukkale Hierapolis is one place that should be visited if you are on holiday to Turkey. A beautiful place with a view of the old city of Roman Empire period. 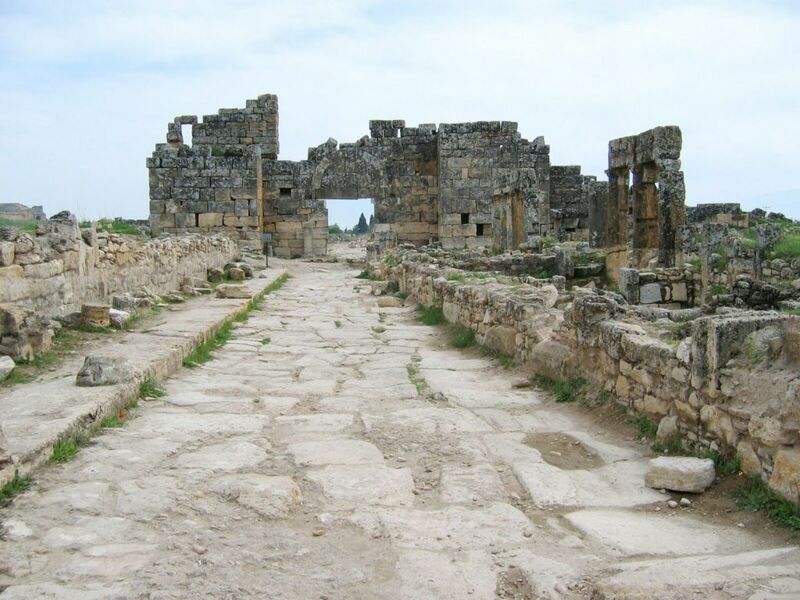 According to history, once said to be founded by Eumenes II, king of Pergamum (197-159 BC), Hierapolis may actually have formed closer to the 4th century BC by the Seleucid kings. 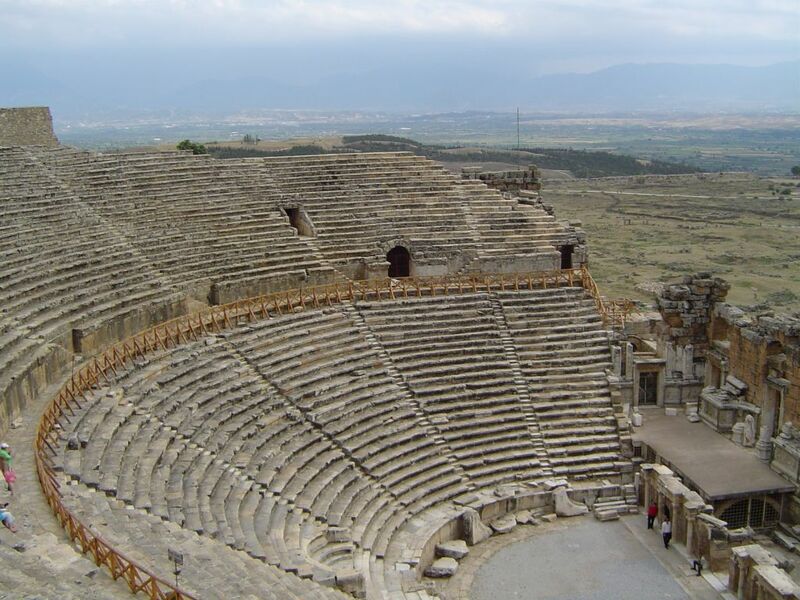 The city name may come from Hiera, wife of Telephus (son of Hercules and grandson of Zeus), the founder of Pergamum myth. Hierapolis has been submitted to the Romans in 133 BC along with the rest of the royal Pergamene, and became part of the Roman province of Asia. This city was destroyed by an earthquake in 60 AD, but rebuilt, and reached its peak in the 2nd century and 3rd. 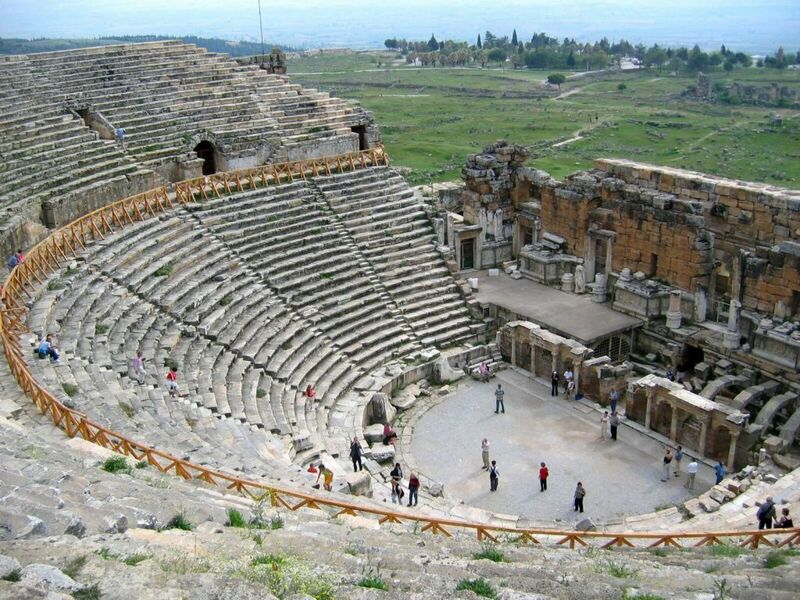 Here you will find many historical relics in the form of temples, churches and there are well-preserved theater of Hierapolis, we can see it, especially the building stage, which is beautifully decorated with reliefs. 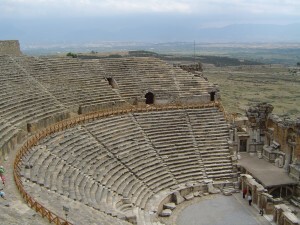 Built around 200 BC, the theater can accommodate 20,000 spectators. 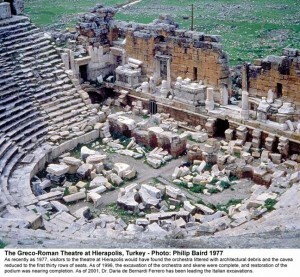 Is not that a wonderful place to begin to imagine the history that existed at the time? 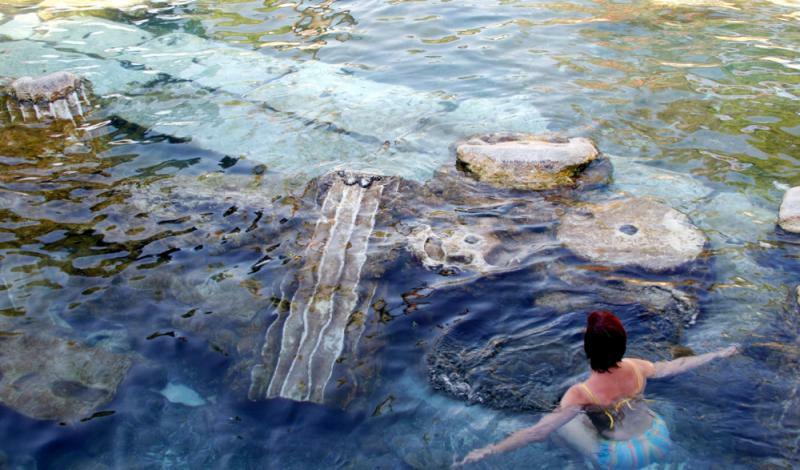 Knowing the local myths and enjoy the scenery around and then stopped by hot tubs. 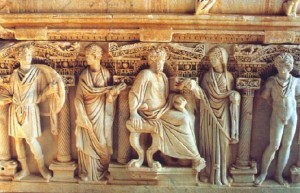 It will be a fun holiday historical research.